Are Your Creams and Lotions Enough? 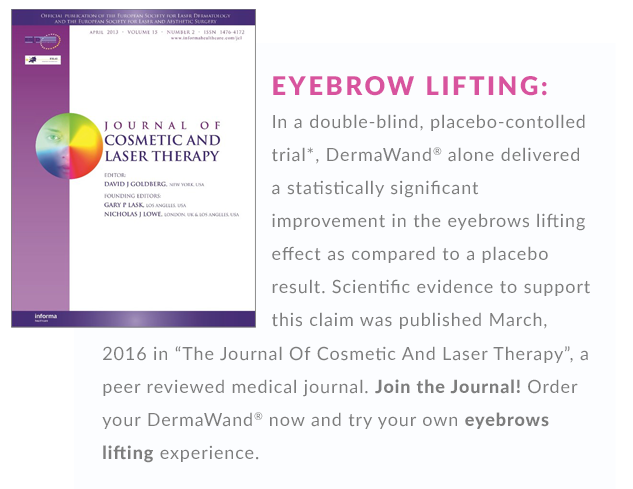 †The above results were confirmed in the DermaWand® trial conducted by Farcodem s.r.l. 100 person, 30 day randomized double-blind placebo-controlled. Both control & placebo groups used DermaVitál ® Pre-Face & Skin Quench® topicals. Control group used active DermaWands, placebo group used identical looking placebo wand. Results for above claims objectively recorded by Corneometer®, Cutometer® & Primos 3 D. Only statistically significant results considered. Just minutes, twice a day! High Frequency/Radio Frequency technology teachings are included in major UK beauty professional education text books and is this technology has been used by skin care professionals for years. This same technology is used in DermaWand® but with a lower frequency and amplitude that’s ideal for daily in-home use to deliver clinically confirmed improved skin care results. The gentle microcurrent delivers thermal energy to the dermal areas under your skin's surface and increasing dermal skin temperature may help support your skin's natural healthy look. DermaWand delivers gentle microcurrent at 100,000 cycles per second, producing a massage effect. Massage helps improve circulation and bring fresh blood, oxygen and nutrients to the skin's surface. DermaWand gives off enriched oxygen which bathes your skin while you're using it. You'll recognize the smell; it's that fresh, clean "after a rainstorm" fragrance. Enriched oxygen will help breathe new life into your skin’s surface and with DermaWand, you will see a reduction in pore size. Absolutely Greatest Facial Item I've Ever Utilized!